Be transferred to Beijing airport from your hotel; fly to Shanghai. Upon arrival, transfer you from airport to Shanghai hotel. Today’s activities include Yuyuan Garden, a classic South China garden with rockeries, pavillions, ponds and corridors; Jade Buddha Temple, a very popular Buddhist temple among local people; the Shanghai World Financial Center for a bird’s view of Shanghai. 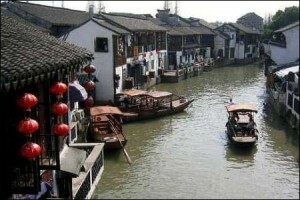 Drive to Zhujiajiao Anicent Town from your hotel. Zhujiajiao Ancient Town is a famous water town of hundreds of years of history. You will visit four scenic spots: Tongtianhe ancient parmacy, the historic Post Office, Yuanjin Temple nd Kezhi Garden. You will also take a cruise on the river through the town. Be transferred to Shanghai airport to fly back Beijing. Upon arrival, Beijing airport to hotel transfer. I am writing as I am interested in this trip. However, you do not actually mention the cost of this trip. Thus, I would appreciate if you could provide me a bit more with more information.